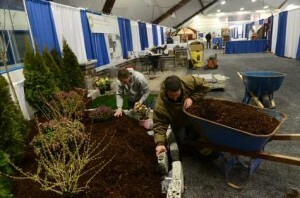 Travis Clark, left, account manager, and Rob Kitzmiller, right, hardscape crew leader, of Hyde Park Landscape Inc., work on the garden display of their booth while vendors prepare Friday for opening night of the 33rd Annual Southeastern Connecticut Home Show at the Connecticut College Arena and Athletic Center in New London. The show is open through 9 p.m. today, 11 a.m. to 6 p.m. Saturday and 11 a.m. to 5 p.m. Sunday. New London – Travis Clark, left, account manager, and Rob Kitzmiller, hardscape crew leader, of Hyde Park Landscape Inc., work on the garden display of their booth while vendors prepare Friday for opening night of the 33rd Annual Southeastern Connecticut Home Show at the Connecticut College Arena and Athletic Center in New London. The show is open 11 a.m. to 6 p.m. today and 11 a.m. to 5 p.m. Sunday.